Make your prediction of who will win and the final score. 85-68, your rip roarin Wildcats!!! Soup for everyone not named Quidley. We win by 14. Could be 94-80 or 24-10 with this team, but I say the spread is 14 and we win. About time for a hot shooting night, 82 - 69, Los Gatos. Hey I'm depressed. Just turned a "THREE-QUARTERS OF A CENTURY". 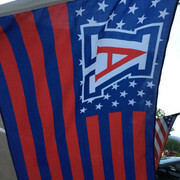 JUST LEFT VEGAS SO I AM USE TO LOSING....SCORE ARIZONA WILDCATS 77 Cougs 70. Actually I won at Vegas...or broke even...when you have to pay $15 every time you park somewhere....you lose!! !